Earlier this year at COMPUTEX 2018, Cooler Master showed us some of their latest innovation in power supply technology which really captured our attention. There was one distinctly clear message which we realised when we saw the range of power supplies at their booth – Cooler Master is focusing a lot on bringing premium products to mainstream users. That is also why, we only saw fully modular power supplies that were rated 80 PLUS Gold and above. The new MWE Gold power supplies series is a new lineup from Cooler Master that caters to the rising demand of premium components for enthusiasts in the Desktop DIY space. These power supplies have the 80 PLUS Gold certification, setting the bar for power efficiency even in lower wattage products. Moreover, all MWE Gold power supplies also comes in a fully modular design. This means that system builders have the choice to only include the kind of power cables they want, reducing the clutter of cables in their computer case. This allows a clean build to improve the overall aesthetics and airflow within the case. Less the talk, let’s tale a look at some of the key features. The Cooler Master MWE Gold power supply is carefully designed and engineered to make sure that it meets the requirements to attain its 80 PLUS Gold certification. This power supply focuses on three main aspects to differentiate itself from any other power supplies in the market – performance, noise and durability. Cooler Master has improved their DC-to-DC topology and has brought them to the MWE Gold series. This ensures that the power supply can stay efficient even in high demands and loads. Typically, the power supply will perform at an efficiency rating of 90%. It uses a single 12V rail design, which has got the capabilities to output up to 549.6W of power. System builders will not have to worry too much about the power hungry graphics card that they plan to place within their system. In fact, this power supply is capable of producing more than 550W of power. The MWE Gold 550 from Cooler Master uses a 120mm fan. This fan is specially designed to operate effectively and silently. It has a silent driver IC that reduces clicks and vibration, and is designed to be self-lubricating and remain silent even after prolonged usage. The fan blades are also certified to be dust-proof (IPX6). Interestingly, even if there is a short circuit on the motherboard, the power supply can potentially save the motherboard from further damage when SCP kicks in! The Cooler Master MWE G0ld 550 is frequently used for our test bench systems. We understand that the power supply is reliable for providing stable power requirements to our components in order for them to perform well regardless of situations. Even when we have to achieve high overclocks on the system, the MWE Gold 550 performs just as expected. Just recently, we got our hands on NVIDIA’s latest GeForce RTX 2080 Graphics Card. 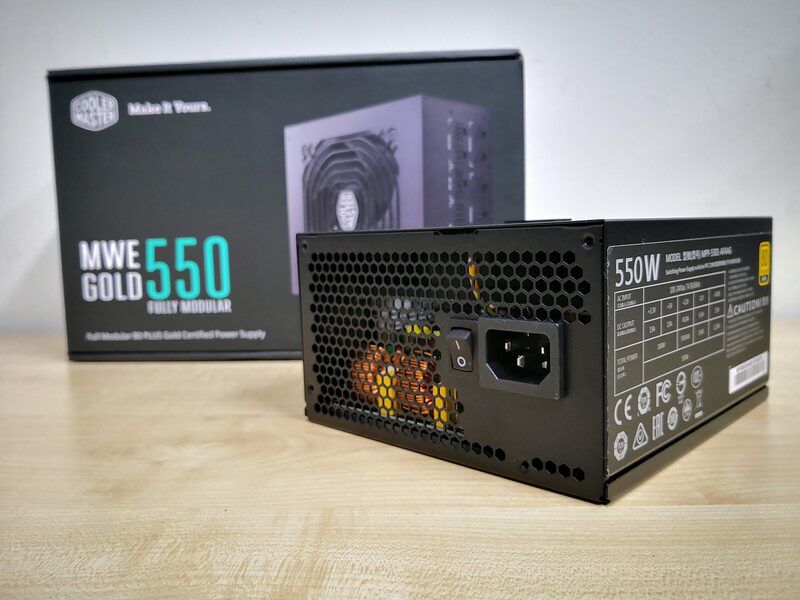 While the manufacturer recommends a power supply of at least 650W, the Cooler Master MWE Gold 550 handled it perfectly thanks to its high performance and quality. Cooler Master also doesn’t over state the power ratings on their power supply. In fact, they have under rated this product, as it has the potential to produce more than 650W of power across all voltage rails. Of course, due to its single rail design, it was able to power the RTX 2080 without any hiccups at all. The MWE Gold 550 performed excellently regardless of the type of stress test or benchmarks which we put the system to. System builders should rejoice, as the highly efficient and fully modular power supplies are now becoming more mainstream and affordable. Gone were the days where you had to pay a premium in order to enjoy these benefits. These power supplies actually perform a lot more than what they are rated for. If you are looking to build a new system, the Cooler Master MWE Gold series is definitely one to consider. The MWE Gold series is now available in Singapore. Huawei Mate 20 Pro - Highlights of this S$1,348 flagship!